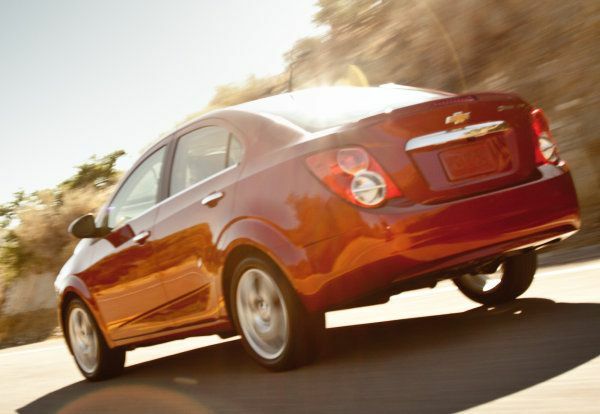 General Motors has announced plans to recall 1,658 examples of the Chevrolet Sonic sedan over a concern that the straps responsible for holding the fuel tank up could fail – possibly leading to damage to the fail tank and a vehicle fire. The Chevrolet Sonic sedans being recalled are from the end of the 2013 model year and the beginning of the 2014 model year with 1,558 in the United States and another 100 in Canada. These vehicles have fuel tank hanger straps that have welds that could break under normal usage. Should the fuel tank straps fail, the tank could either rest on the exhaust pipe or the plastic fuel tank shield with the only support for the tank being the plastic shield and the filler tube. If left unaddressed once the retaining straps break, the filler tuber or tank shield could fail to support the weight and that would allow the tank to hit the ground. Once it is left to drag, the tank could rupture and leak so with the presence of a high heat source – like the exhaust system that is located very near the fuel tank – there is a high risk of a vehicle fire. Fortunately, General Motors discovered this potential problem at the Orion Assembly Plant where the Chevrolet Sonic is built and with this only applying to a very fresh batch of vehicles, many of those 1,658 sedans affected are still in the custody of dealerships around the United States and Canada. Because of this, there have been no reports of accidents, fires or injuries stemming from the problematic fuel tank straps in the 2013 and 2014 Chevrolet Sonic sedan. Those vehicles included in the recall which have reached customers will be contacted and asked to return for the necessary repairs. Unfortunately, since the hoards of useless, greedy politicians in Washington have shut down the NHTSA website, the level of detail on this recall is shorter than usual and we aren’t real clear on when this recall will officially begin. Once this Chevrolet Sonic recall does begin, General Motors will likely replace the problematic fuel tank straps with units that do not have questionable welds. If you have a late model year run 2013 Chevy Sonic or one of the new 2014 Sonic sedans and are concerned about this, contact your local Chevrolet dealership for more information. If you are mechanically inclined, you can locate the fuel tank under the car and make sure that it appears to be suspended as it should be to make sure that you are not at an increased risk of a vehicle fire. Should the strap be broken, it won’t be very hard to notice with the broken strap pieces and the fact that the end of the fuel tank will be sagging unnaturally. If you do see that the tank strap appears to be broken, call your local dealership before attempting to drive the vehicle.